Prince Charles visited flood-hit homes and businesses in Cumbria on Monday. The Prince of Wales was shown the devastation caused by Storm Desmond earlier this month and spoke with local residents about how they have been coping in the aftermath. The royal visitor also met members of the armed forces, who told him about the dramatic rescue of an elderly woman who was trapped underneath her stair lift for five hours, with floodwater rising to her chest. After hearing the officers were able to carry the woman to safety before she was hurt, he said: "Thank goodness." Charles also visited Greystone Community Centre, where residents sought refuge, the McVitie's factory in Carlisle and Appleby-in-Westmorland. Earlier this month, Prince Charles made an undisclosed private donation to the Cumbria Community Foundation to help those affected, and his Prince's Countryside Fund also released £40,000 from its emergency fund and launched a public appeal, which has raised a further £20,000. The Prince's Charity, Business in the Community, is also supporting Cumbria's recovery through its Business Emergency Resilience Group. Among the residents visited by the Prince were Dorothy and David Richardson, both aged 72, who showed him around the downstairs of their home in Warwick Road, Carlisle. The three-bed semi, flooded for the third time as the storm hit, was left under more than two feet of water. The couple will not be home for Christmas and it will be September until their house of almost 50 years is habitable again. Mrs Richardson said: "It feels a bit surreal really, but it's very kind of him to come and think about us. He has a special feeling about Cumbria." Charles also travelled to nearby Greystone Community Centre to meet members of the emergency services who were called out at the height of the floods. Representatives from charities including the Salvation Army and Red Cross who provided support and members of the military shared a cup of tea with him. 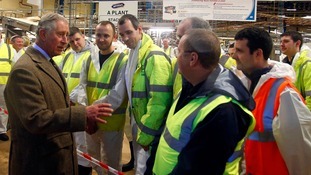 The Prince's trip to Cumbria began with a visit to the McVitie's factory to learn how floods affected the business.